I’m writing about food foraging for my MFA. I advise others to be extremely careful when foraging for wild food. Avoid poisoning yourself. “When in doubt, throw it out,” and all that. But I can be rash when deciding what to put in my own mouth. My thesis adviser suggested I explore this paradoxical way of thinking further. Where did it come from? I immediately thought of my father, an incorrigible calculated risk taker. One of a dying breed of humans who have had aggressive interactions with bears. My father is a wonderful storyteller. The charm of his orations is due both to his innate performance ability and the strange and wild nature of his tales. Family and friends would sit around the fireplace and ask him to tell the same stories over and over, the octopus story, the mountain goats, the bear. While I was visiting my family in Maryland this winter, I asked my father to once again tell me the bear story. 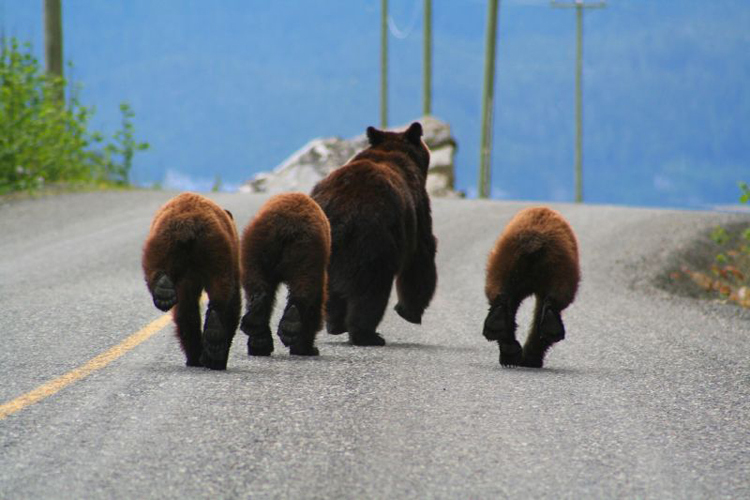 “Bear Bums” by Jethro Taylor. Me: I remember you telling me some story about berry bushes and a bear. Dad: This is being chased or chasing the bear? They’re two different instances. Me: Tell me about chasing the bear for now. Dad: I was foraging on a survival training [around 1955]. I was 14. It was part of being a Boy Scout, Eagle Scout. I found a patch of gooseberries. I surprised a black bear and I thought: Dinner! Mindlessly, dinner! I was hungry. I took off after the bear and I thought I could use my hunting knife, if I jumped on its back, and slice its throat. I don’t know if I really would have done that. But I went full-speed at the bear. The bear came up out of the berry bushes and shot up a hill. I got to the base of the hill and started up after it. Then I fell back on my back. The slope was much steeper than I thought. I was kind of glad not to have the confrontation with the bear. Me: I suppose that would have been impressive for your camp mates. Dad: It probably would have been highly illegal, too. But when I fell back in there, I noticed an abundance of berries where the bear had been foraging. So it wasn’t totally a loss. Me: Was anybody else in your scout troop thinking a bear would be a good idea? Dad: I didn’t tell them. I always had trouble with this story as a kid because the thought of my gentle, loving father killing anything was heartbreaking to me. It’s difficult for me to think of him of anything but kind and nurturing. I can tell by a subtle halting reluctance that he is as embarrassed by this story as he likes telling it.